“La Danta” or tapir is the largest terrestrial mammal in South America. 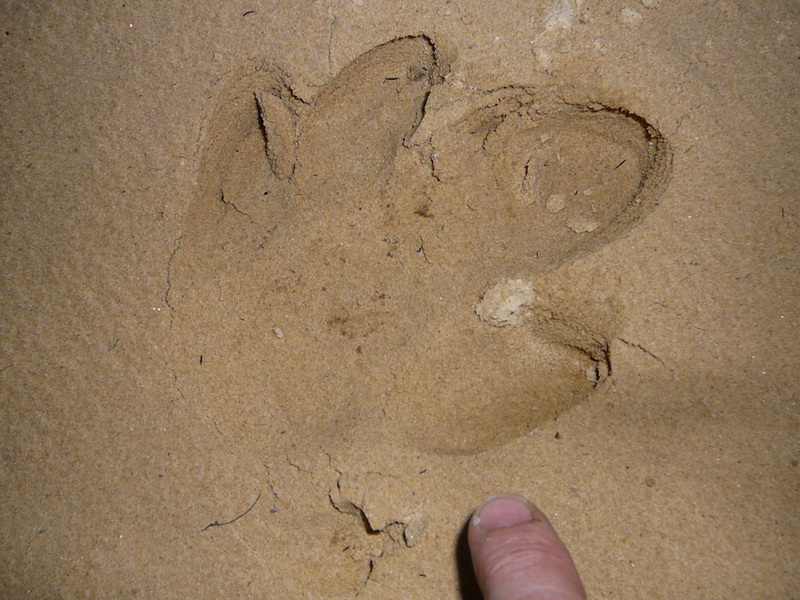 Belonging to the Perissodactyla order, it is related to Equines (horses) and rhinocerotidae (Rhino). Quite massive , it is almost the size of a small pony. In all species, the female is larger than the male and the young looks the same: a reddish brown hair with streaks and white spots. We know little about their habits, but it seems they are monogamous. These animals are extremely aloof and it is very difficult to see them in nature, despite their large size. Tapirs often hide during the day. At night they roam the forest in search of food on a territory estimated at around 10 km2. The presence of water is essential to tapirs: it refreshes them and rid them of parasites. They do not hesitate to dive to escape their few predators (mainly humans and jaguars). The tapir has a strictly herbivorous diet. Very selective, it feeds on seedlings, fruits and seeds it collected with its short prehensile trunk. Its wide teeth are perfectly adapted to cut branches and break seeds. The tapir plays a key role in forest regeneration by scattering with excrement seeds of some consumed species. That is why it has been given the nickname of “forest gardener”. Finally, the disappearance of the tapir has a direct impact on the forests’ diversity and structure. In the world there are four species of Danta or Tapirs, three in America (Tapirus terrestris, Tapirus pinchaque, Tapirus bairdii) and one in Asia (Tapirus indicus). Colombia houses the three American Tapir branches, being the country with more species. 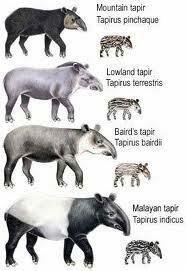 All the Tapirs are threatened of extinction due to the loss of their habitat and the hunting mainly. In addition to the three species, Colombia also holds the Colombian Tapir subspecies (Tapirus terrestris colombianus, Hershkovitz 1954), which is endemic to the country and is critically endangered of extinction. There are also two other subspecies: Tapirus terrestris terrestris, Linnaeus, 1758 and Tapirus terrestris aenigmaticus, Gray, 1872. The Tapirs are very ancient animals. Several hypotheses are trying to explain the origin of the present Tapirs in Colombia. The first proposal by the scientist Hershkovitz in 1954 says that the 3 present species in Colombia were originated from North America, and they independently migrated to Central and South America. The first tapir that arrived to Colombia was the Mountain Tapir or Tapirus pinchaque, in a period of time where the level of the sea in equatorial latitudes dominated the tempered climate. 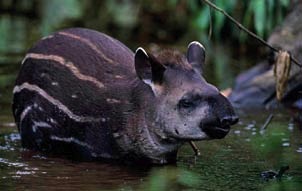 Later, when the Andes mountains rose and the temperature increased at sea level, other species of tapirs were able to invade these new tropical habitats established at the base of the Andes: the Central American Tapir or Baird’s Tapir (Tapirus bairdii), the last immigrant to Colombia. 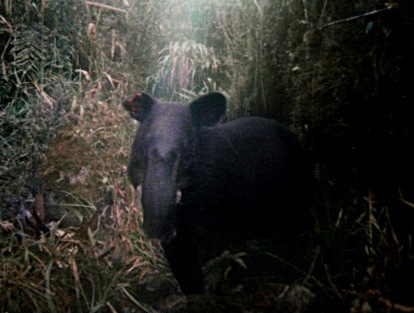 The second hypothesis of the scientific Haffer in 1970, suggests that species of tapirs in Central and South America, the Tapirus terrestris and Tapirus bairdii, originate from the Mountain tapir (Tapirus pinchaque), an immigrant ancestor, who came to the Andes during its rising. Across South America, deforestation is the main threat to the survival of the species. 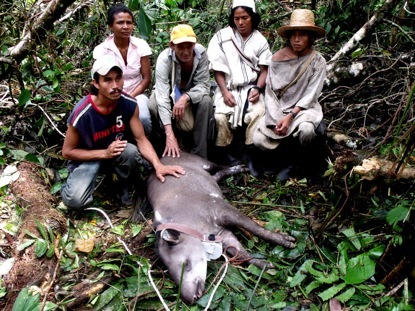 We estimated that on 40% of its distribution, the tapir has a low probability of survival. The hunting therefore represents a major problem as, most of the time, the number of killed tapirs is too high compared to the natural capacities of regeneration of the species. These animals are catalogued as “umbrella species”: protecting these species indirectly protects the many other species that make up the ecological community of its habitat. Being the largest in size, tapirs need more space than other species, and, consequently, if we help them, we are also helping all the associate biodiversity that shares the tapir’s habitat. After six years of working with the conservation of the Tapir in Colombia, the Nativa Foundation establishes the Colombia Tapir Fund. 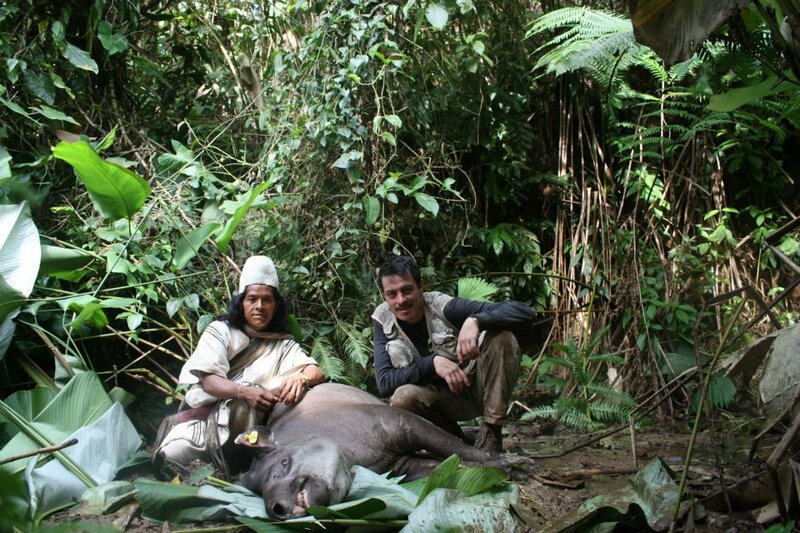 The objectives of the Colombia Tapir Funds is to collect donations mainly from people and organizations that wish to participate in the preservation of the Tapir, by means of the Monitoring Program of the Colombian Tapir that the Nativa Foundation is leading at the present time. 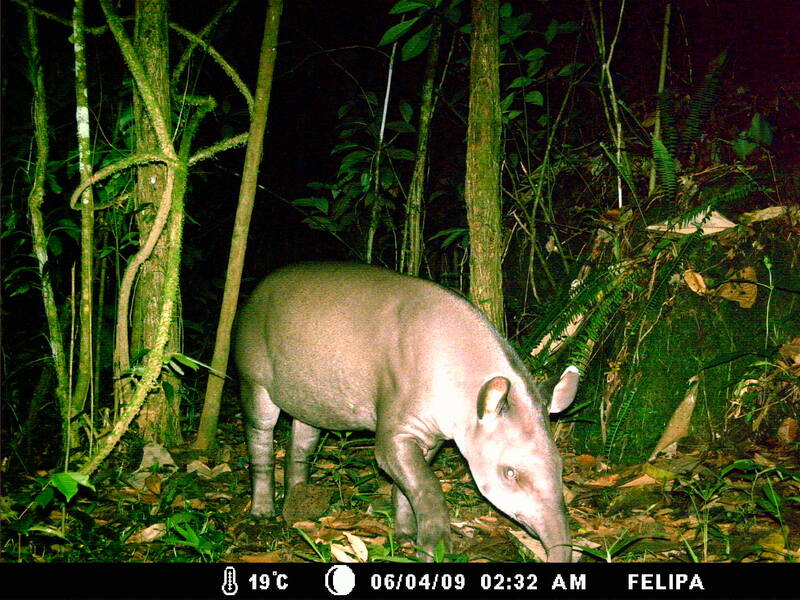 Working for several years on conservation of the Tapir and its associated biodiversity, the Nativa Foundation is now able to identify and monitor these mammals through trap cameras with the collaboration of the influential communities for a successful strategy. In this way, Nativa is looking forward to establish a network of photo-collecting’s stations where evidences of current presence of Tapirs have been established, and where the people who cohabit with these animals, are those who monitor the program, with the support of the Nativa Foundation and the corresponding Regional Independent Corporations and National Natural Parks. The Nativa Foundation will state the presence of the Tapirs in the places of implementation of the Monitoring Program, afterwards it will educate interested people in each locality about the use of the trap cameras. Most prominent will enter the monitoring program, where they will receive an economic repayment or in-kind compensation for installing and maintaining trap-cameras and take photos. Since some time now, the Nativa Foundation is working with the country people from Tambo Robado, in the rural district of La Castellana in San Agustín, Huila, on the photographic monitoring of the “salados” or “saladeros”, where the tapirs go frequently. Today, the goal is to consolidate photo stations in the salados, monitored by the locals, as well as initiating the snap shooting cycle, tagging them and then collecting biological samples and body measurements, and then, evaluating population of these enigmatic mammals. All the field procedures are done by the local people together with the Nativa Foundation. 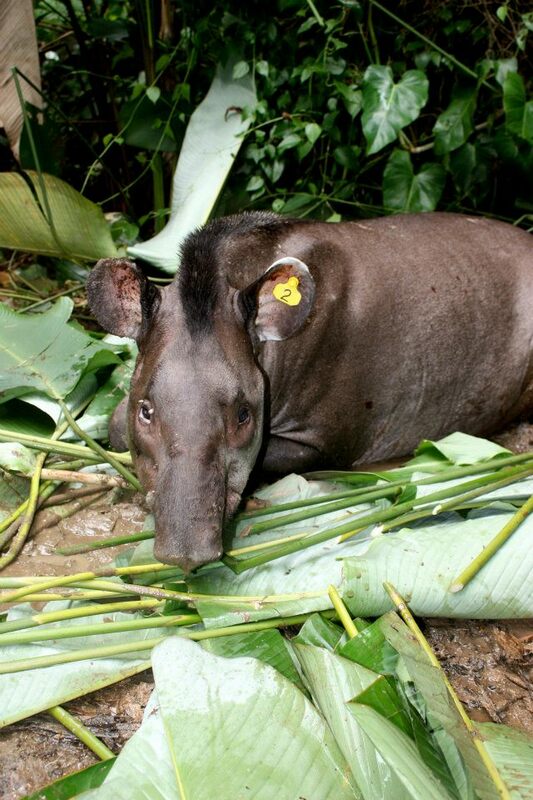 Nativa has already collected information and established good contacts in the Chocò region at the border with Panama in order to work on the current presence of the Baird’s tapir.